I need some suggestions for making candy topiaries. Hope you can help! I have searched and can't find the answer to my question. 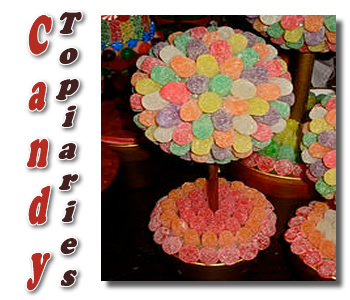 I want to make a candy topiary tree for a birthday celebration. I know I need the oasis, covered in silver foil or paper, and I am fine with the plant pot etc. What I can't figure out is how to get the sweets to stick to the foil/paper without having to stand for ages with each sweet and wait until the icing or chocolate sets (I have tried both). I don't really want to use cocktail sticks as the trees will no doubt be attacked by children. Is there some sort of edible spray glue or something I could use? I was thinking of using minstrels (round counters of chocolate with a hard shell). Any tips will be gratefully received. I grabbed a few photos courtesy of Milena NYC and Teaching Tiny Tots for those who may not know what candy topiaries are all about. These are terrific for a birthday party, a wedding or baby shower, or any special holiday. Who isn't tempted by yummy edible candy centerpieces? Okay, let's discuss your assembly concerns. I assume when you say the "oasis" you are referring to the foam ball or cone that forms the top of your candy topiary tree. gun to attach the candy. This would work quickly and easily. If you want to use unwrapped candy, you'll probably need to just wash and dry the styrofoam form and leave it uncovered. You may even want to "scuff" it up a bit to make the frosting stick a bit better. There are two options or suggestions I could make for attaching unwrapped candy. Do they have prepared cake frosting in little tubs there in England? That works pretty well. Don't get the whipped frosting, just the regular because it is thicker and will hold the candy better. All you have to do is cover the oasis or foam with a nice thick layer of the cake frosting and then press the candies onto the frosting. The other option is a homemade mixture of icing sugar (powdered/confectioners sugar) and water. If you can't get your hands on the cake frosting or if you don't like the way it works, you can try making your own "glue" with a cup or two of icing sugar and a few teaspoons of water. You want the mixture to be fairly thick. It's not as easy to work with as the frosting, but you should be able to get it to work. Apply a layer to the foam base and then dab some on each piece of candy before pressing it in place. Toothpicks do work well for candy like gumdrops, jelly beans (for an Easter candy centerpiece), or other soft jelly candies, but I can understand your concern with the kids. 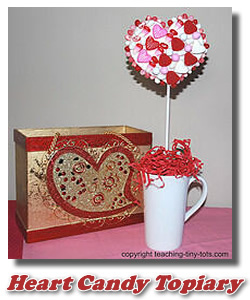 I hope these suggestions will enable you to make some lovely candy topiaries. Let us know how they work out for you and submit the photos of YOURS when you have them finished! I've never heard that about it being against the law to use cocktail sticks in sweets when catering. I suppose they are worried that someone will poke their throat or something. Or is it for sanitary reasons? Double dipping? Who knows. They seem to make more and more laws every year to supposedly protect us all from our foolishness and lack of common sense. I guess I shouldn't be surprised! Are cocktail sticks against the law ? Hi. I've read that it is against the law to use cocktail stick on sweet trees in catering, is this true ?